This red lentil soup recipe is based on the best lentil soup EVER from a local Turkish restaurant. Seasoned with herbs and spices — including mint and smoked paprika — this pureed soup recipe is bound to become your new favorite comfort food. Last year, I met a friend for lunch at a local Turkish restaurant. The lunch special included a bowl of their signature red lentil soup, and some pita bread for dipping (a must). The soup had such a unique, warm, and comforting flavor, and I found myself craving it for weeks until I was able to return to the restaurant and order it again. I couldn’t quite put my finger on what herb I was tasting in the lentil soup, until I did a little research into Turkish soup recipes and discovered that the mystery flavor was mint. The dried mint gives the soup a brightness that I haven’t found in most traditional lentil soup recipes. Once I figured out that mystery herb, I set to work trying to recreate the restaurant’s red lentil soup at home. It was surprisingly easy! I balanced out the mint with a combination of sweet and smoked paprika. And to give the soup some additional heft and creaminess, I added a diced potato to the mix. 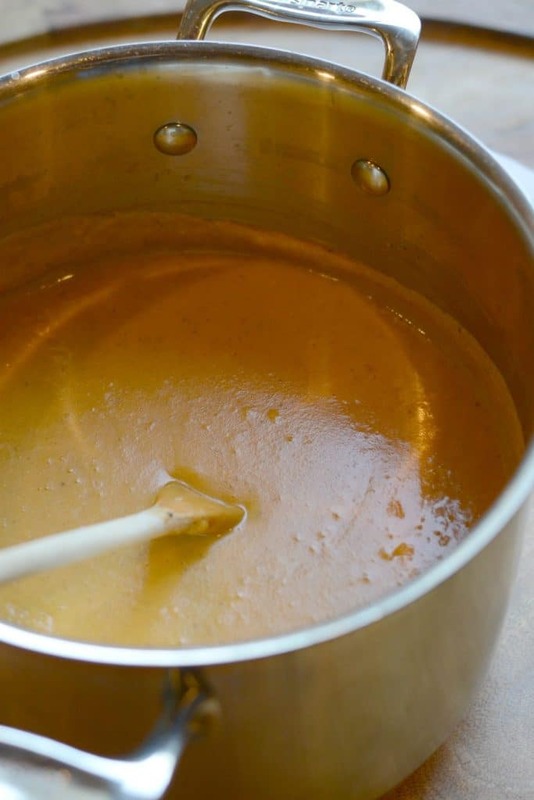 The potato gives the lentil soup a great texture when it’s pureed. 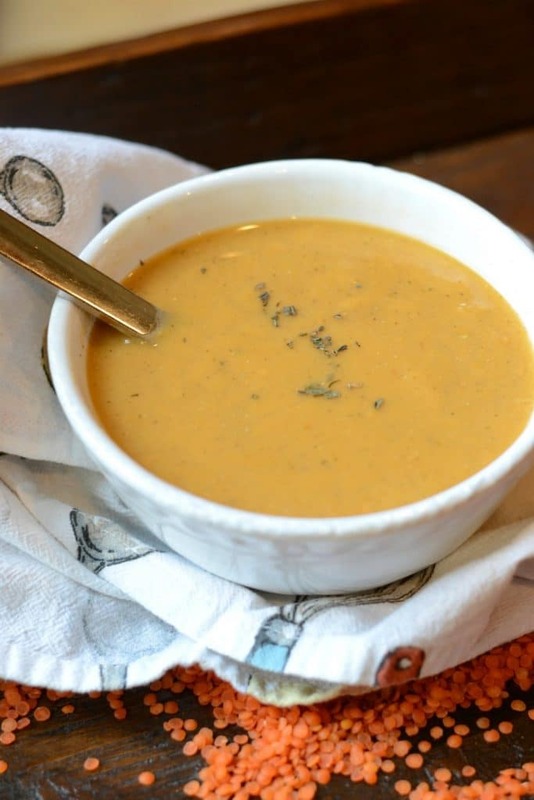 Just as with my authentic pasta e fagioli soup, this red lentil soup tastes creamy despite the fact that it’s dairy-free (and it can easily be made into a vegan soup if you swap out the chicken broth with vegetable broth). It’s especially simple to puree the soup if you have an immersion blender on hand, because you can blend the ingredients right in the pot. That means less dishes to wash. 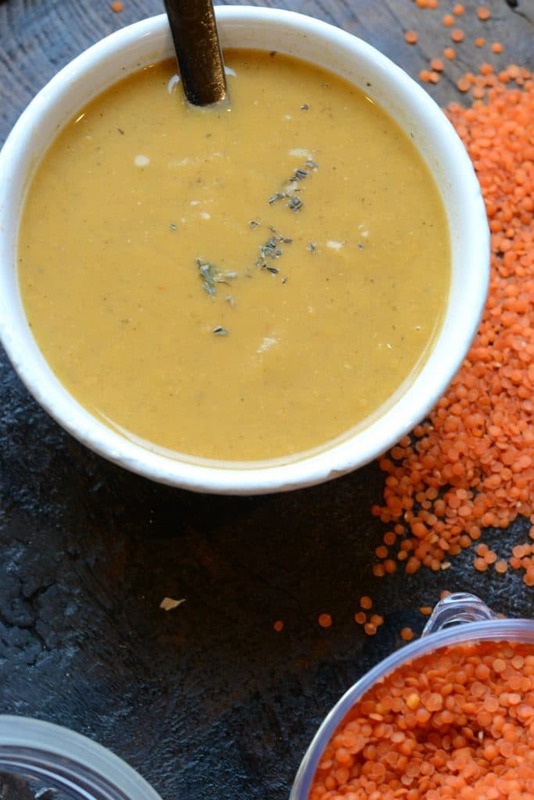 If you’re already a fan of my other tried and true soup recipes, I’m almost positive you’ll love this red lentil soup, too. It’s got a unique taste, but it’s one I keep craving again and again — especially in the winter months. And as a bonus, it’s packed with nutrients (there are many health benefits of lentils), the ingredients are inexpensive, and you can keep most of them stocked in your pantry for a quick and easy weeknight dinner. If you participate in Meatless Mondays, this would be an excellent recipe to add to the rotation. If you swap out the chicken broth with vegetable broth, this recipe becomes vegan. And it’s every bit as delicious! 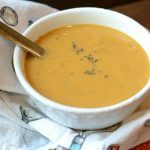 A simple, nutritious and delicious pureed soup made from red lentils, mint, smoked paprika, and other seasonings. Heat olive oil in a large soup pot. Add onion and stir, cooking until translucent. Add garlic and saute for one additional minute. Add all other ingredients to the pot. Bring to a boil and then reduce to a low boil/simmer. Simmer for 30-40 minutes, or until lentils and potatoes are soft. Transfer in batches to a blender and blend until smooth (or use a stick-blender to blend directly in the pot). Serve with warm pita bread for dipping. Begin with 8 cups of broth, and add additional broth if needed to achieve desired consistency after pureeing. You can substitute vegetable broth for chicken broth if you'd like to make this a vegan soup recipe.